Professor Lee, Ji Oon has been selected as a member of Young Korean Academy of Science and Technology (Y-KAST). 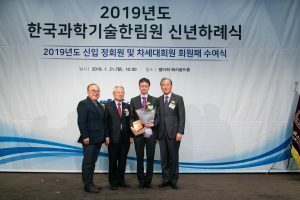 The Korean Academy of Science and Technology announced a new list of its fellows and Y-KAST members on January 21, 2019 and hosted a ceremony in Seoul to award fellowships and memberships. A total of 26 Y-KAST members were chosen this year. In addition to Professor Lee, five other KAIST professors made the list as well: Lim, Mi Hee (Chemistry), Kim, Shin-Hyun (Chemical and Biomolecular Engineering), Lee, Jung Ryul (Aerospace Engineering), Lee, Hyunjoo (Chemical and Biomolecular Engineering), Jung, Yeon Sik (Materials Science and Engineering). Y-KAST consists of researchers with creative minds who are under the age of 43 and have demonstrated great potential to contribute to the development of Korean science and technology. Professors Lee has been recognized internationally for his outstanding work in pure mathematics, mathematical physics, and probability by taking up research projects that require using bold and creative approaches. Approximately 150 people including Lee, Myung Chul, KAST President, and Moon, Mi Ok, Adviser to the President for Science and Technology of Korea, attended the award ceremony. Professor Lee, Ji Oon, third from left, is posing for a photo after the award ceremony. Posted on 2019-01-29 , updated on 2019-01-29 .